Letters From A Tapehead: Mount Eerie: "This"
I know what to expect when it comes to Phil Elverum. I knew for example that, once I found out Elverum, (or as he's professionally known, Mount Eerie), had released a new single, that I was probably going to need to listen to it five or six times before I'd have ANY idea of how to describe it. Elverum is blessed with a distinct and sensitive hand when composing melodies, his harmonized quests dominated by subtlety, warmth and a light dose of unease. Elverum's new single, "THIS," is the first from the upcoming new Mount Eerie release, Sauna, which will be out in early February through his P.W. Elverum and Sun label. The song begins with an aftershock, the type that would normally follow an unspeakably horrible or dramatic event, and then transitions into a graceful organ melody that's eventually built upon by the voices of Allyson Foster (Hungry Cloud Darkening) and Ashley Eriksson (Lake), a beautifully sung first verse is accompanied by light bass tones. Woodwinds eventually flutter as if an ensemble were tasked and a severe amplified drone blankets the flurry. It's lovely and unsettling. The track was premiered on NPR. All info on the release came from Force Field PR. 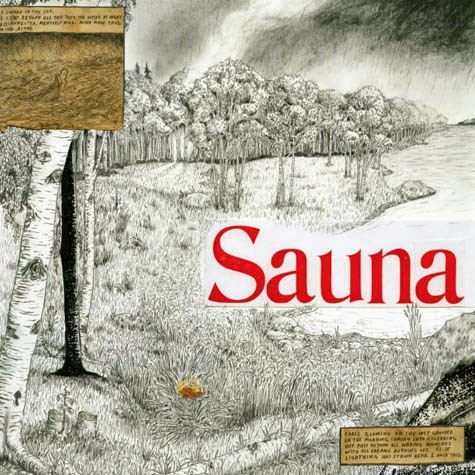 Mount Eerie is pleased to announce a new full length album to be named Sauna due out from P.W. Elverum & Sun on Feb. 3, 2015. "Vikings and zen and real life" are the reference points. All of the song titles are single words and some of the songs are very long. This is music meant to weigh heavy on you like a lot of cold water at night, and also the sword glimmering at the bottom of the lake at night. Twelve songs, 55 minutes total, inhabiting two high resolution 45rpm LPs, super-pretty heavy old-style gatefold jackets, jumbo poster, download card... luxury packaging.